A year and a half ago I met travel writer Leigh McAdam at the rustic Shadow Lake Lodge near Banff. It was a cold and snowy February evening and we’d each chosen the lodge for a relaxing cross-country ski get-away. Leigh and I got to talking and it turned out we’d done a lot of the same adventures. It was great sharing stories of places we’d both been and I was excited about the book she was working on. Discover Canada: 100 Inspiring Outdoor Adventures has now been released and it’s a treasure trove of fun ways to enjoy nature in Canada. 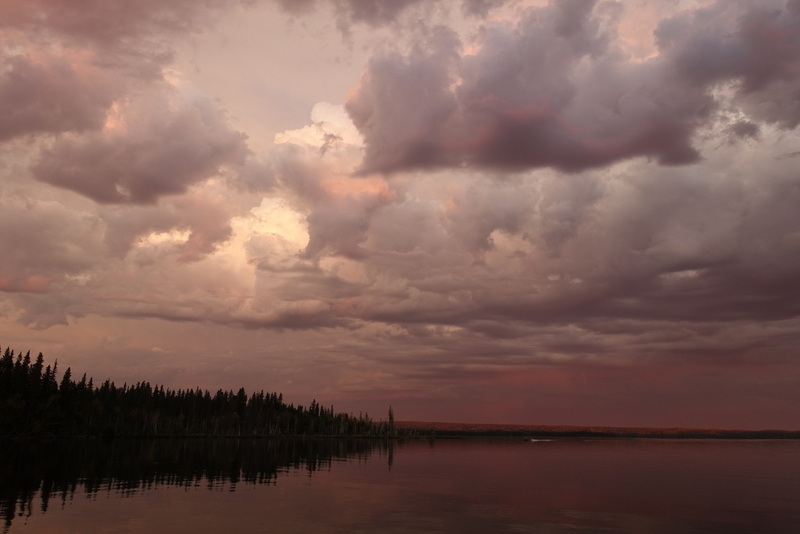 One such trip that she’s recently featured on her blog is Alberta’s only canoe circuit. 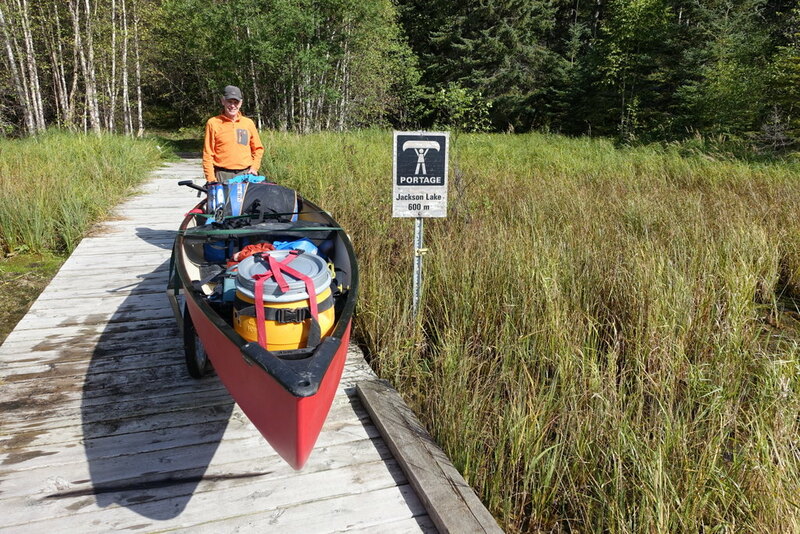 Last week Sil, Jim, Susan, and I made the drive up to Lakeland Provincial Park to paddle the 38-km route and we couldn’t have been happier with Leigh’s recommendation. We picked up a canoe from Jamie at Lakeland Expeditions. Jamie was very helpful, meeting us in Lac La Biche the evening before we planned to start paddling with a canoe and all the gear. We spent the night car-camping at Touchwood Lake. It looks like the kind of campground that can get pretty busy at the height of summer but it was peaceful and offered great views on a late-August weekday. 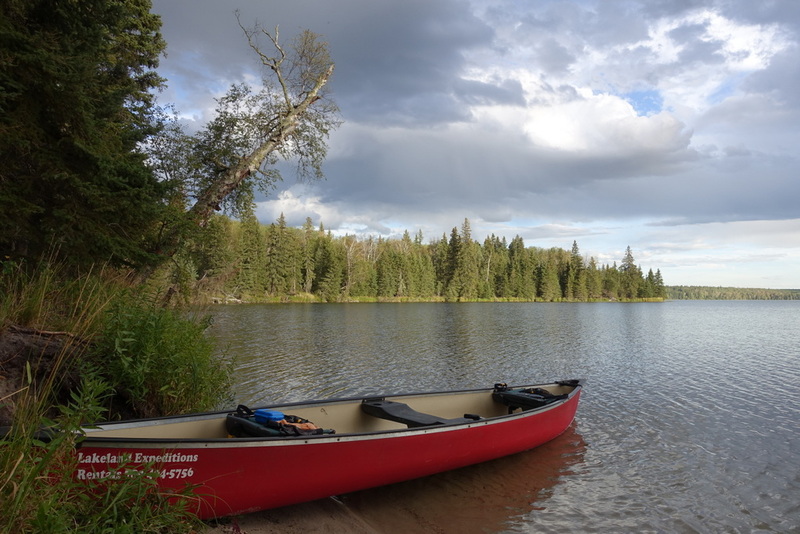 The canoe circuit starts with a 3-km portage along a wide and gentle trail to Jackson Lake. There are canoe carts provided just a one-minute walk down the trail. Place your canoe on top (it’s a two-person job), strap it down, and away you go. Much easier than carrying it over your head. When you get to Jackson Lake, just leave the cart. Hopefully, it will still be there when you return. We paddled down Jackson Lake and under a little bridge into Kinnaird Lake. We were all really surprised at the change in water-colour and quality. Jackson Lake seems to be filled with green algae. I wouldn’t want to drink that water, even after filtering it. Kinnaird Lake, on the other hand, is clear, blue, and not bad tasting. We camped at the campground on a peninsula mid-way down the lake. It’s marked on the map as having two tent sites but it was easily big enough for twice that number. There are fire-rings and picnic tables and a bear locker for storing food. There’s a short portage trail from Kinnaird to Blackett Lake but we went with the more scenic option: just keep paddling down the narrow channel at the far end of Kinnaird. 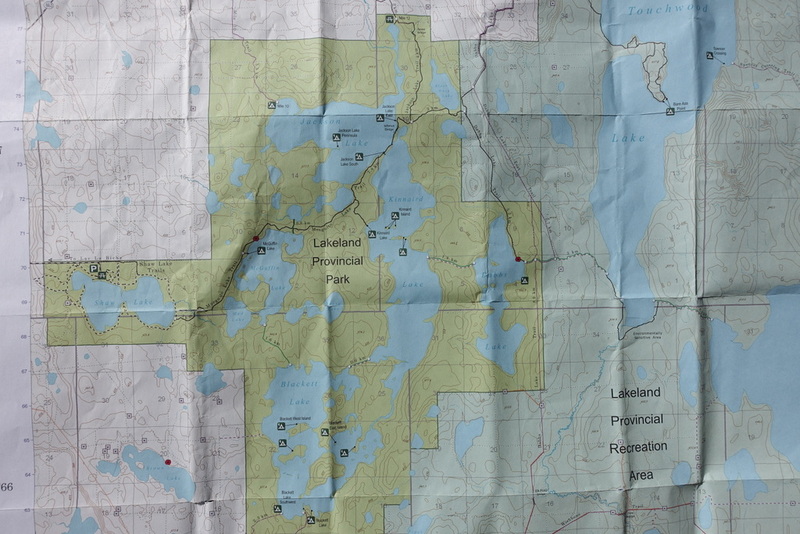 This lets you explore much more of Blackett and puts you quite near a few campsite options. At first we took out at the peninsula campsite but found it rather overused. There was a fair bit of garbage lying around. That’s a shame for an otherwise beautiful area. 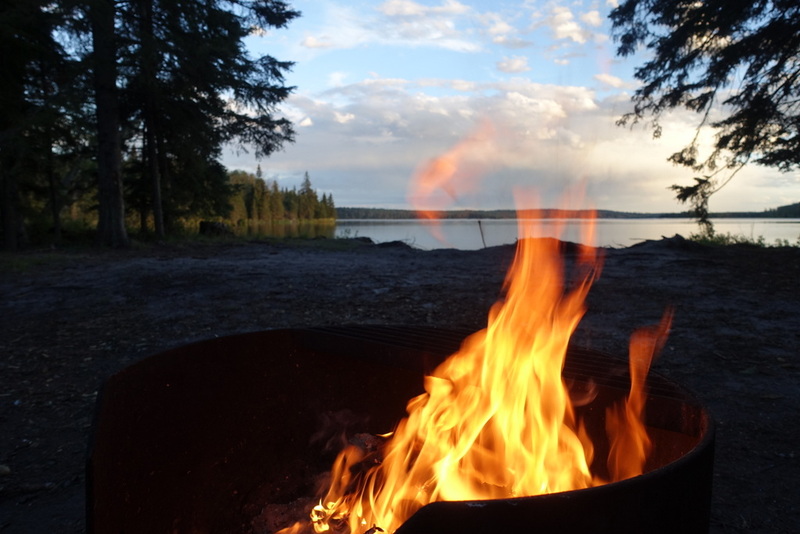 We relocated just a few minutes away to Blackett East Island and found a fantastic campsite with great views. Being just a bit off the water on a small rise really let us see so much more. When you’re at water level it can be surprisingly hard to tell what’s the shore and what’s an island. You have to follow the map quite closely. The portage from Blackett to McGuffin Lake is only 1.6-km long but it’s much harder than the Jackson Lake portage at the start of the circuit. The trail is much rougher with more ups & downs and a boardwalk that’s sometimes just wide enough for a cart tire to get stuck. What really makes it hard is that there’s only one cart and it has flat tires and a broken handle. You can’t really complain, though. Everything on the circuit is free, including use of the carts and even the campgrounds. 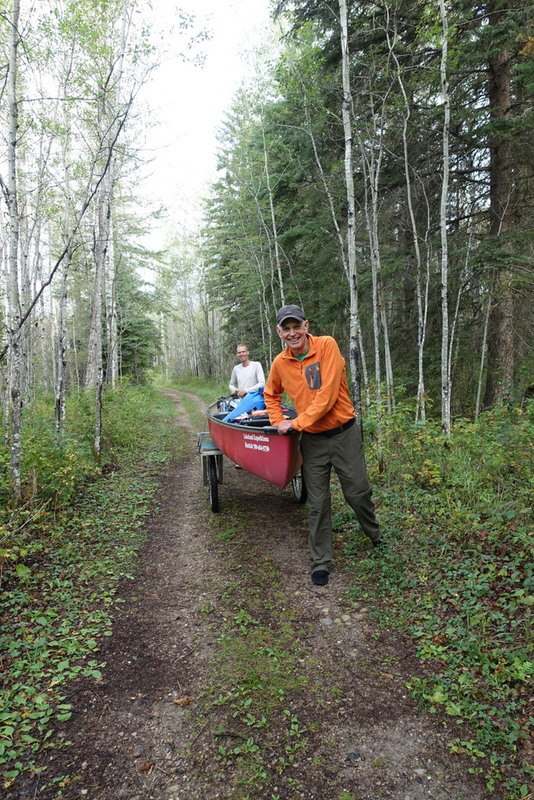 After a bit of hard work we got both canoes through the portage without any real trouble. 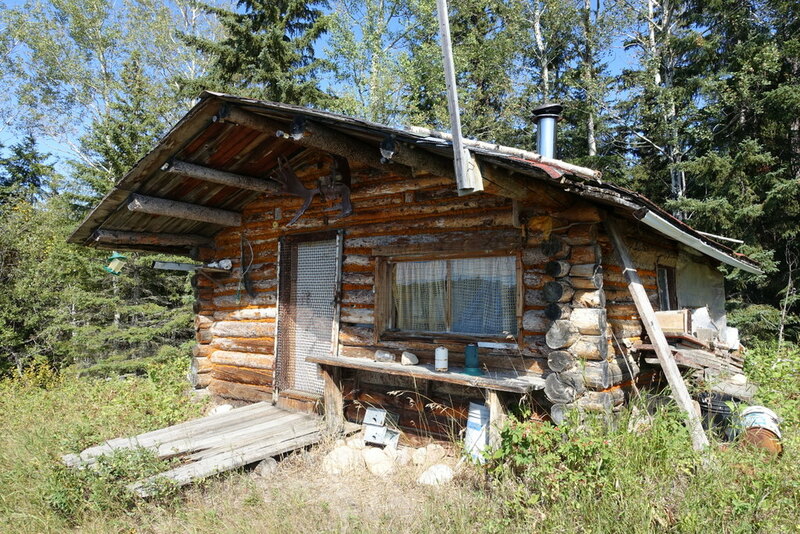 Just before the portage we spotted an old cabin overlooking the lake. It’s a great place to enjoy lunch while looking back at where you’ve come. 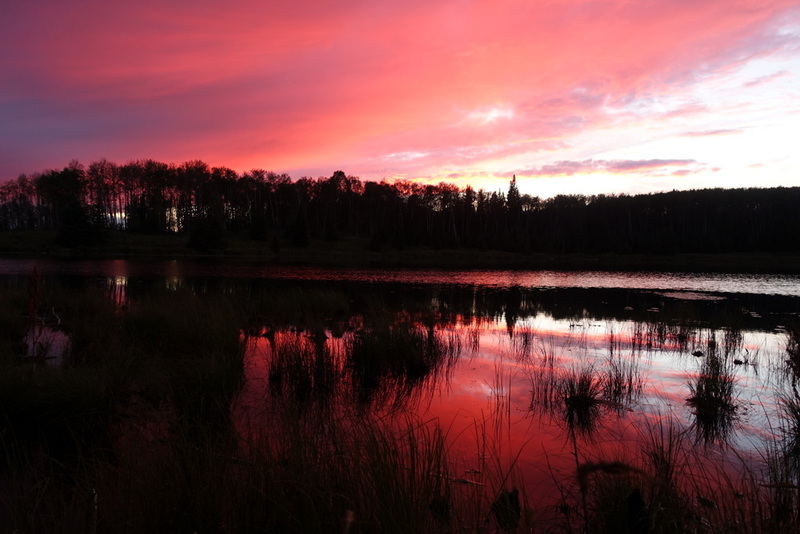 McGuffin is another beautiful lake surrounded by boreal forest, just starting to change to autumn colours. We saw many loons, bald eagles, kingfishers, geese, herons, ducks and shorebirds. I especially love listening to the call of the loon at dusk as the water becomes glassy calm. Sil really got a kick out of the name of this lake. Her favourite dog is also named McGuffin (Guffy for short) and we imagined how proud he’d be if he were here (actually, he probably wouldn’t care about the name but he’d be really excited about all the treats he’d get around the campfire every night!). In fact, Lakeland is dog-friendly, so feel free to bring Fido if you come. There’s a short and gentle portage back to Jackson Lake followed by some ponds connected by a narrow channel. Be sure to collect any drinking water you need before reaching the main body of the lake as it turn to algae water again. We really lucked out with the weather. The water was calm every morning and when we did have wind it was quite manageable. The canoe provided by Lakeland Expeditions wasn’t a speed demon but it was quite stable and easy to keep straight when the wind did come up. The Lakeland canoe circuit is a bit of a best-kept secret. The only one of its kind in Alberta, it’s a bit like the little sister of BC’s Bowron Lakes Circuit. You’re guaranteed great scenery, lots of bird life, and (if the weather cooperates) a relaxing few days of paddling. We found four days was just right.